Robotic-Arm Assisted Technology is used for partial knee (medial, lateral and patella-femoral) AND full knee replacements. It is also used for some hip replacements. It applies sophisticated 3D planning, virtual surgery AND robotic precision cutting tools, for accuracy and minimum tissue damage. 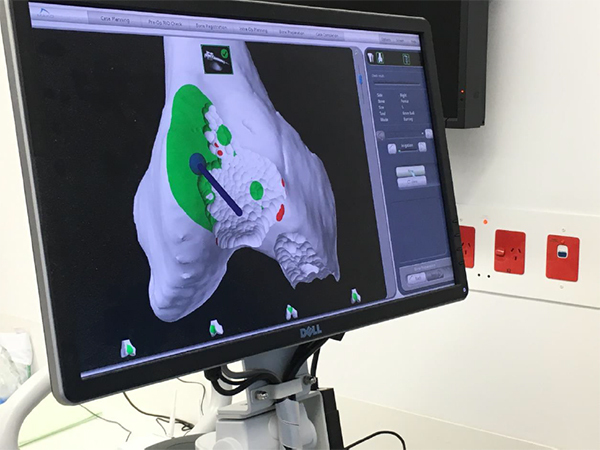 Using a specific 3-D model of your anatomy, the Mako technology and the Robotic cutting arm, guides the surgeon to execute a fully personalised surgical plan with fine control. 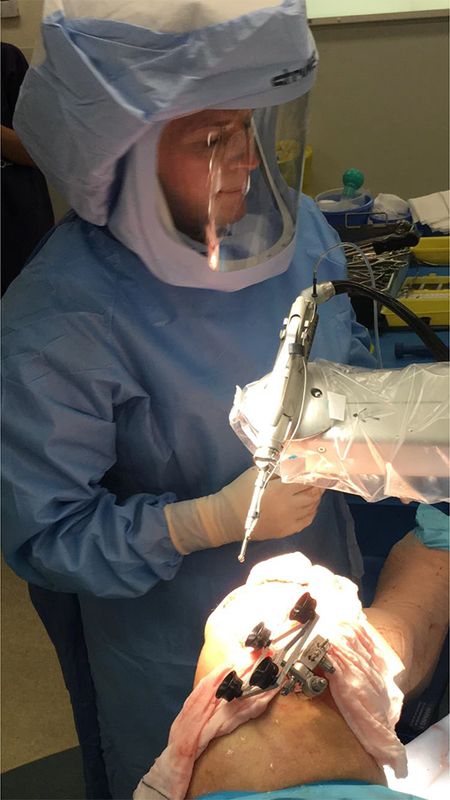 Mako robotic orthopaedic surgery technology allows your surgeon to perform the surgery with a less invasive approach and personalize your surgical plan. Further, during the procedure the surgeon can adjust and align the implant in real time, before making the final cuts. Are you a candidate for the Mako procedure? The first step is to get your complete medical history including your symptoms, when they began, how they have progressed and any non-surgical treatment(s) you have tried. Dr Boecksteiner will then perform a thorough examination of your joint, she may, observe you while you are standing and walking, examine your knee, hips and ankle alignment, and evaluate your range of motion, ligament stability and angular deformity. If surgery might be the best option for you, a weight-bearing X-ray is often needed to determine the extent of damage. 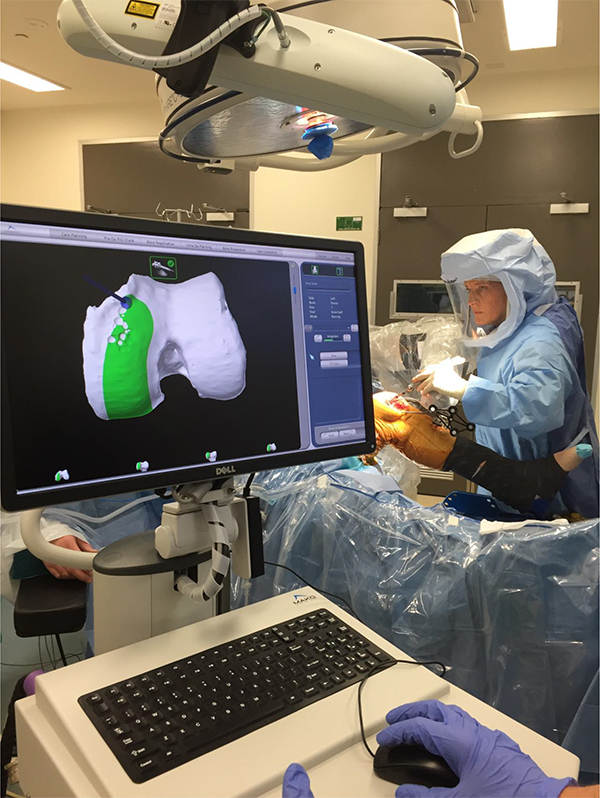 A CT scan of your joint is used to generate a 3D virtual model. 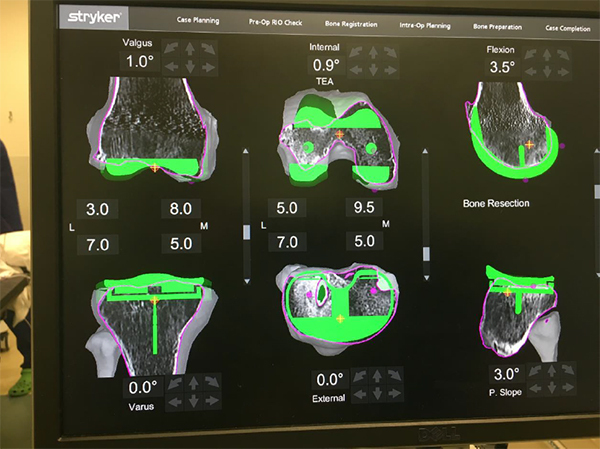 This provides us with the information we need to properly determine the damaged areas that need to be removed for the precise placement of your knee implant. This virtual model is uploaded into the Mako system software and is used to create your personalized pre-operative plan. In theatre your surgeon will use the Mako plan to assist in performing your surgery based on your personalized pre-operative data. You will be asked to walk soon after surgery, and most patients are back to normal daily activities such as driving a car within two-three weeks. How long can an implant used in a Mako last? All implants have a limited life expectancy that depends on several factors including a patient’s weight, activity level, quality of bone stock and compliance with the doctor’s orders. However, alignment and positioning are also very important factors affecting the life expectancy of an implant. By using the Mako Tactile Guidance System™, we aim to achieve the optimal alignment and positioning for your implant to help it last as long as possible.